Entire books have been written on the subject of improving your holiday photographs, but have you noticed how they tend to be illustrated with the work of professionals taken over many years in numerous exotic locations? Is that cheating? I decided to give the standard holiday photography advice a true test: to see if I could get good holiday pictures in one summer week in one location with one ordinary camera. The location was Grindelwald in the Swiss Alps, about three hours by train from Zurich. The village has a panoramic backdrop of mountains – the Eiger, the Jungfrau, the Monch – and offers convenient cable-car access to magnificent views and walks. My camera was an ordinary Canon DSLR, one of the most affordable and popular on the market, with two lenses, a wide-angle zoom and a short telephoto zoom. I had several memory cards on which to store the pictures, but my only accessory was a polarising filter to help deepen colours and boost the blue of skies. I ticked the first few boxes in my holiday photography top tips before getting on the plane. Choose a scenic location with good photographic potential: tick. Pick a suitable time of year (in this case early summer for the alpine flora): tick. Check out guidebooks and make a list of likely photographic subjects: tick. My list included mountain views, alpine flora and fauna, people, architecture, transport, weather and details. The idea was to capture the flavour of the place. The location was spectacular. Everywhere you looked there were mouth-watering mountain views. Surely any idiot could take a good picture here? All you had to do was point the camera and shoot. Well, not exactly. As the technique books often tell you, the human eye is a wonderful thing. It captures depth and breadth as well as colour and shape; by contrast the camera can produce flat, uninspiring views that lack the essential qualities that made you want to photograph the scene in the first place. Surprisingly, landscapes can be among the trickiest subjects. It was all too easy to take frame after frame of distant peaks that resembled nothing so much as a row of ice cream cones. I needed foreground interest, context, atmosphere. We took the gondola up to First and walked along the well-marked, undulating path to Bachalpsee, where I was able to get shots of the more distant mountains with rocks and reflections in the foreground, giving a much greater sense of scale and depth. That was more like it. On the way back, I snapped a group of walkers on the snaking path against the mountain backdrop. It was a people-shot of sorts, but not quite the local colour I had in mind. It is always a good idea to look out for festivals and events while you are on holiday. Although they can produce some hackneyed images, they can also enable you to grab candid shots when the subjects are in costume and happy to be photographed. 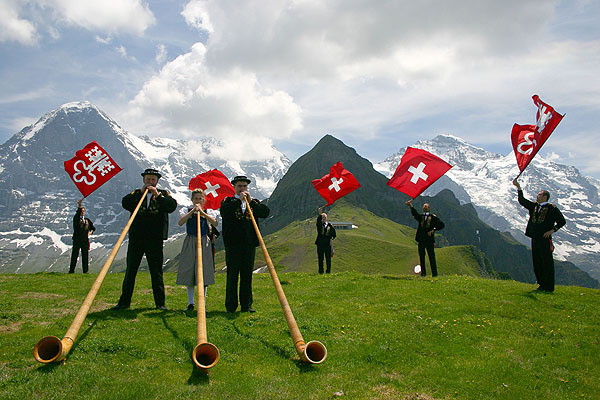 Purely by chance we were in Grindelwald at the time of a local folk festival at nearby Mannlichen which promised an array of authentic activities: alphorns, folk dancing, a mountain cycle challenge and flag-throwing. No yodelling, but plenty of local colour. I concentrated on those hurling flags high into the air and managed to get a few ‘action’ shots. Tick. We timed our visit in the hope that the alpine flowers would be at their best. We certainly had no difficulty in finding brilliant blue trumpet gentians, yoke-yellow globeflowers and starry white pasque flowers for close-up shots. A word with our ever-helpful holiday rep provided useful tips on where to see uncut meadows at their best. Animals were more of a hit-and-miss affair but we did come across mountain goats, cattle with cowbells and even an alpine salamander. All in all, I felt I had ‘got’ the flora and fauna section of my task-list. Transport and architecture tend to be strongly evocative of a local area but they are sometimes ignored by the holiday photographer. Cable-cars and wooden chalets were obvious candidates for Switzerland in these categories, but it proved difficult to avoid chocolate-box pictures. Nevertheless they felt like ‘must-dos’ and I tried to use the wider context or unusual composition to overcome the clichés. That left just weather and details on my shoot-list. Most holiday pictures are taken either in full sunshine, because that is what people associate with holidays, or else dull conditions, because those were the only conditions ‘but we were on holiday and I had to take a picture’. Ironically one of the most interesting times to shoot can be if the weather conditions turn nasty. We were ‘lucky’ enough to experience a couple of typical, short-lived, late-afternoon mountain storms that cleared the air and produced rainbows and later sunsets. Magic. If the weather turns, keep shooting! Some of the ice cream cone mountain tops were now worth photographing. Details can be good for lending colour to your holiday pictures both metaphorically and literally. In the Grindelwald area I was particularly taken with the brilliant umbrellas at all the outdoor cafes. Not necessarily classic ‘Switzerland’ but a useful contrast to the more expected shots of snow-capped mountains and flower-decked chalets. Along with any souvenirs and your memories, photographs are among the most tangible and lasting results of a holiday (notwithstanding sunburn or the credit card bill). A good set of holiday pictures can help you to re-live the experience in the dark days of winter, to share it with friends and to make prints, albums, websites, even books. Good pictures will even help you to forget the queues at the airport. I certainly feel my Swiss experiment shows that it is possible to get a superior set of holiday snaps on a normal holiday without a professional camera by following a few simple guidelines. With just a little planning and effort, it is possible to enjoy your holiday and your photography.